I’m in the midst of completing an MA assignment on formative assessment. I wrote some preliminary thoughts on the topic a while ago but I’ve since had more time to read around the topic and digest ideas further. Two of the strands I’ve been looking into have been verbal and written feedback and I’ve found some interesting things written about each that has made me think more deeply about my own practice. Most schools have a policy on written feedback, it normally involves looking at books at least every other week and issuing some feedback relating to the quality of the work and how it could be improved. This is based in sound principles, but I feel leaves a lot to be desired. I questioned the logic in a previous post and suggested that this was a little strange and that misconceptions would arise and be missed, learners would forget the work etc. Hattie (2012) agrees on this topic, suggesting that feedback should be instant to avoid learners learning something wrong. Hattie’s findings in his meta analysis that feedback has a much larger effect size than any other intervention is often quoted as a headline and used to back up the necessity of a new marking policy. The problem is the headline is not fully representative of the findings. Hattie also says the biggest spread of effects in this meta analysis ilfalls within feedback and that some isn’t paticularly good. He points out key principles of immediacy, relevance and structure of the feedback. Hattie built on the work of Black and Wiliam (1997) which stated effective feedback was formative feedback which focused on the task, rather than the learner, and gave the learner help to get to where they are going. This is the premise behind most marking policies, but at up to two weeks after the exercise has been completed this can often be too late. The obvious advantage of verbal feedback I’d that it is immediate and instantaneous. There is no time to consolidate mistakes and learn misconceptions as they are picked up straight away. On top of this verbal feedback is done in the presence of the learner and as such enables a dialogue to take place. This means that the teacher can be totally sure of why the learner has gone wrong and try to fix the issue. Another advantage is for learners who have completed the work correctly, a dialogic conversation between learner and teacher can allow the latter to check whether the work has been understood on s deep level or whether it has just been learned as a procedure. Obviously there are issues, it’s hard to get around the whole class every lesson and I don’t have an answer for that. There’s also the matter of evidencing that this is taking place, this one is easier to fix, if you have your red pen with you you can highlight errors, model answers, scaffold or extend and mark what’s there while you talk. I’ll write more about the assignment as I go along and after I’m done, the area of formative assessment is one that has really piqued my interest. What are we testing for? There are many types of assessment that take place within our schools. Formative, Summative, AfL etc are all buzzwords that relate to some kind of assessment that occurs on a daily basis, each with a different perceived purpose. So what is the big picture? What are we testing for? Should we be doing it? I was recently told by someone that they had received feedback from a lesson observation which marked them down for “lack of AfL”. I asked if they had been given anymore information than that and was told that the observer had said “You need to use lollysticks or whiteboards.” This left me a little underwhelmed. The person I was speaking to was an NQT, and I thought that feedback was fairly meaningless and certainly less than helpful. That aside, I do think there is place for AfL in lessons, I’m a big fan of whiteboards, they’re versatile, they allow you to check answers from a whole class to ensure they know how to do something. They don’t, however, do some magic and allow pupils to remember how to do things forever. Lollysticks, on the other hand, seem less useful for AfL. I’ve always been told they are “AfL”, but I don’t really see how. You still only get an answer from one person. They may be good for some things (whether they are or not is a debate for another time, but you can read Tom Bennett’s (@tombennett71) thoughts here), but I don’t see how they fit here. If the feedback was, ” You need to ensure whole class engagement, try using a random name selection method such as lollysticks.” I could have understood it. If it was “You need to ensure the whole class are ready for the task, use whiteboards.” I could have understood it. but to say “You need AfL use lollysticks or whiteboards” just doesn’t help anyone. AfL is great, but use it correctly, ask yourself “why am I doing this?” if the answer is “to tick a box” then don’t bother! If it’s “because it will aid the pupils learning.” Then give it a hell yeah. This whole dichotomy which is often discussed between formative and summative assessment seems silly. Yes, there’s a difference between checking progress in a lesson on a whiteboard and sitting a test, but surely the point of end of term tests is to see how much pupils have learned? If your class have done half a term on Algebra, and they all got the expanding brackets questions wrong then you need to go back over expanding brackets. Thus the assessment is still formative. I think in class tests are a vital part of what we do, but their primary purpose should be to inform future teaching and learning, with progress monitoring a by product. When progress monitoring becomes the primary gain, we’ve got our priorities confused. These are the output of our education system, what we are always building towards. It seems strange to put teenagers through such tribulations at an age when hormones are flying etc, but I’m not sure what the answer is. We need to have some form of qualifications that distinguishes each of us. @Bigkid4 has some good suggestions here. If you have any ideas I’d love to hear them. This post is part of the #blogsync initiative for June 2014, you can read the others here. During February the #blogsync topic was on engaging and motivating pupils. 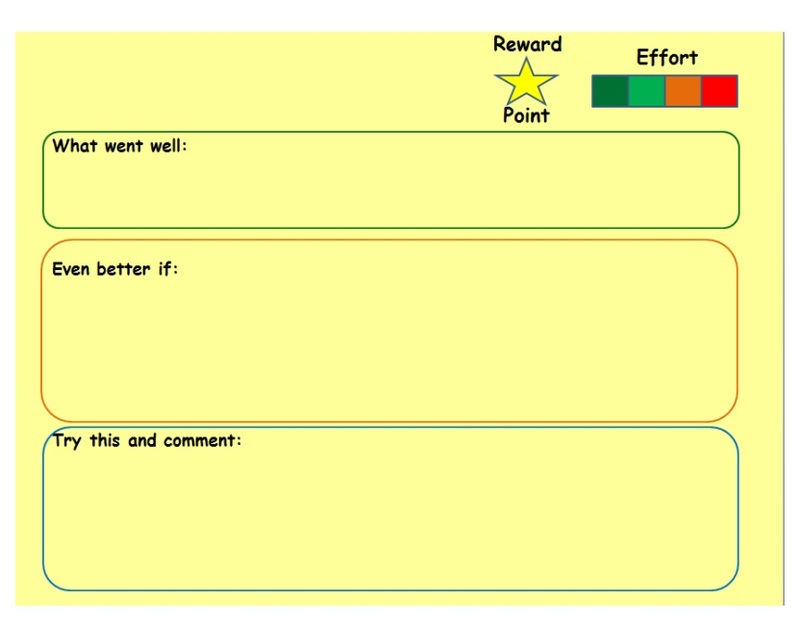 In school, as a department, we were looking at ways to engage pupils with written feedback and to motivate them to interact with that feedback and attempt the challenges set. I figured that these two things would dovetail nicely and the idea behind this post was formed. I had all responses from 1 to 5 and the mean was 2.7 (1dp), unsurprisingly my top set year 8 had a mean of 3.5 which was much higher than the other classes. I ran with the new idea for a term and re asked the same question. The results were slightly higher, this time the mean was 3.2 (3.9 for said year 8 class). The data suggests that there is an overall increase in engagement with written feedback. I looked through some of the slips to see if anyone had drastically changed, and there were a few people who put 4’s that had put 2s, and a few who had jumped up one, so I asked them why they thought their perception of the helpfulness of marking had changed. There were two main answers that they all seemed to give a variant of. “Because it’s much easier to read when it’s typed,” and “There is a question to do”. During this time my HOD did a marking scrutiny and commented that my marking was much easier to read when typed, so I have taken this on board and intend to use consistently in future. Most of the team are using it now and we are going to implement it across the whole team next year to bring consistency to our marking. I’m under no illusion that these surveys constitute concrete proof that the new marking strategy has improve the engagement with the written feedback in my classes, but all pupils are now answering the questions which certainly shows they are reading it. 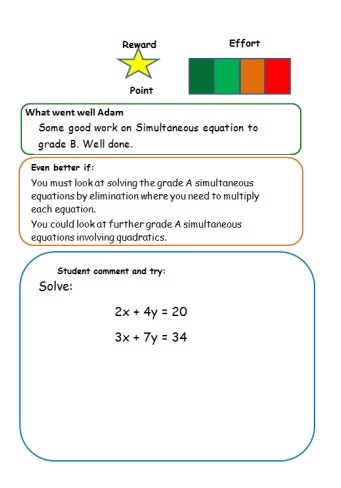 This is different to before where the higher ability pupils would write excellent comments, the lower ability pupils would write something like “thanks” and middle ability pupils would not write anything. The effects seemed to be higher on lower sets than it did on higher sets, but this could related to the fact their baseline was much lower. I hope to repeat the survey at some point next year with my classes to see how the data looks after a prolonged period of using tis marking strategy; this should give me an idea of the long term effects. The evidence suggests that the new strategy has increased engagement within the sample. This is because the feedback is easier to read and it includes something for pupils to attempt, rather than to just read. This is enough for me to decide to continue with the strategy.